Picture courtesy of the Anaheim Police Dept. 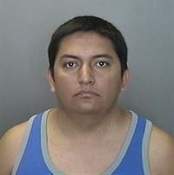 Anaheim police and members of the Orange County Human Trafficking Task Force arrested Andres Parra Terrones, 28, of Santa Ana and Irina Martinez, 27, of Anaheim on Monday following an investigation into the prostitution ring. Officials say the two ran their “business” out of the Motel 6 at 100 W. Disney Way, according to the LAist.com. Anaheim Police vice investigators hope the booking photos of the suspects may lead other women to come forward. Anyone with information is asked to contact the Anaheim Police Department Vice Detail at 714.765.1482 or the Orange County Human Trafficking Task Force at 888.373.7888 or here, according to the OC Weekly. Andres Parra Terrones, 28, of Santa Ana, is charged with two felony counts of pimping. He is also charged with one misdemeanor count each of child abuse and endangerment. Authorities also accuse him of driving without a valid license. Co-defendant Irina Martinez, 27, of Anaheim, is charged with three felony counts of pimping. She is also charged with a misdemeanor count of child abuse and endangerment, according to CBS News. What I want to know is who was doing business with these people? Tourists? Locals? Did the pimps keep names in a little black book? This could get very interesting as the investigation continues. « Pulido opposes the Downtown Santa Ana PBID tax!